A new poster, based upon one of my recent paintings, will soon be circulating throughout the 10 campuses of Maricopa Community Colleges (MCC), promoting the college system’s 26th Annual League for Innovation Student Art Competition. 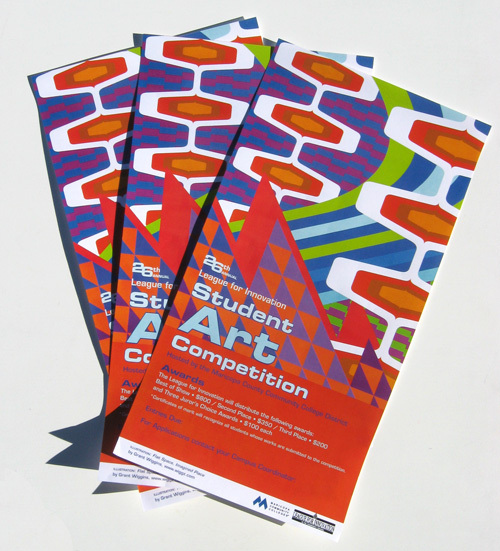 Posters for Maricopa Community Colleges’ 26th Annual League for Innovation Student Art Competition. I’ve enjoyed a fruitful, collaborative relationship with Maricopa Community Colleges over the past several years. 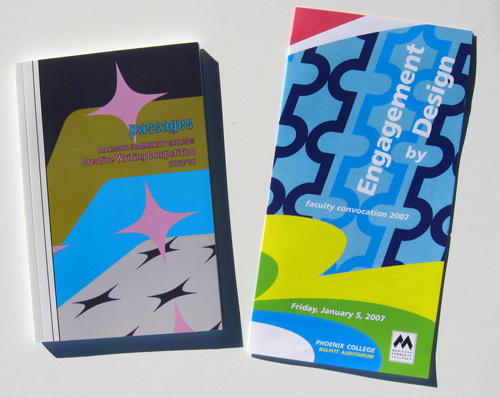 In 2004 and 2005, I designed a pair of posters for MCC’s Honors Forum Lecture Series. My art has been featured on a 2007 faculty convocation program and a collection of winning entries for a 2007-2008 student writing competition. 2007-2008 MCC publications featuring designs adaptated from my paintings. Overall, I’m very happy with this new poster, and I’m very excited to see how the art competition turns out. My thanks go to Ms. Sieradzki for inviting me to share my work. It has been a pleasure to collaborate with her yet again! Please make the 1980s go away…for once and for all. Face it: In terms of design, the 1980s was a wasteland. Postmodernism was cool. 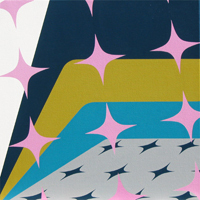 … And Panton went pastel, for crissakes. But the decade’s lack of design sensibility is coming back more and more each day. And it’s bad. Do your best: Please make the 1980s go away. Karl Lagerfeld knows what’s going on. Converse with him. Think about the future, even if it means drawing from the past. Nostalgia is an enervating pursuit. First post to my art blog … at last! On Saturday I was searching for “1970s corporate logos” via Google image search and I instantly found two new favorite logos — both from Pennsylvania, at that. These “finds” (one of which is undoubtedly an everyday sight for Philly residents) offered me instant inspiration, leading me to fill my notebook with possible ways of remixing these logos into new designs. Above are the logos of SEPTA (from phillyist.com) and, to the right, Penn Central Company (from scripophily.com). Something incredibly cool has arrived in my mailbox. Make that under my mailbox — it was too big to fit! 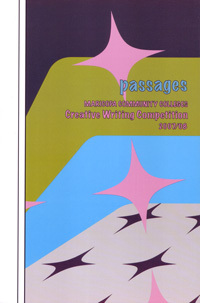 I just received a couple of copies of Passages, a collection of fiction, essays, and poems submitted to the Maricopa Community Colleges Creative Writing Competition. On the cover is a tightly cropped image of a painting I made back in late 2006, titled Still Life with Inverted Florida Maritime. Left: The cover of Passages. Right: My 2006 painting Still Life with Inverted Florida Maritime. What’s really cool is that the book’s designer, Janet Sieradzki, isolated elements of the original design and incorporated it through the rest of the book. (I provided her with the original Illustrator file.) In other words, in the Fiction section, you’ll see a group of diamonds; Essay features a diagonal borrowed from the design’s stripes. It’s fascinating to see how a designer can run with my work and make it new. I see my own work in a completely new way. And it’s refreshing to see my work in a completely unexpected context — a college writing contest. Congratulations to Janet Sieradzki for doing something new with my design! Nicely done, Janet!